Incoming recruit Ben DiNucci will stay closer to home after turning down a cross-state Ivy League education. After months of being vetted by various college football programs, Ben DiNucci finally finished the recruiting process. 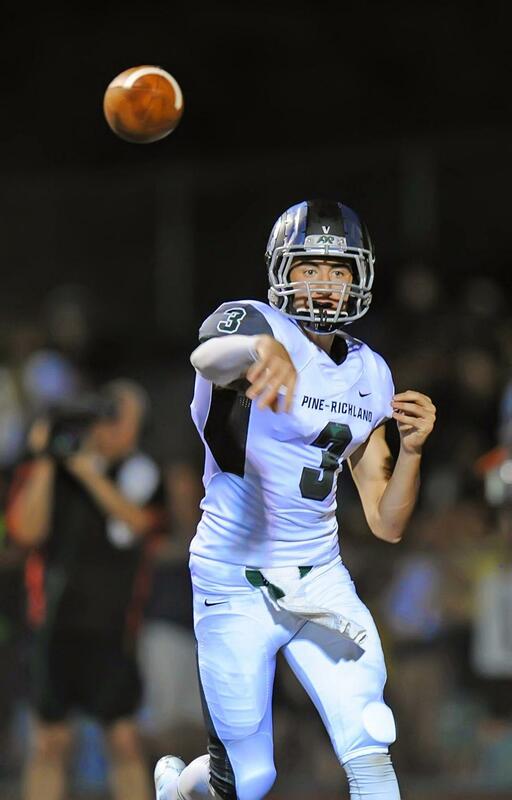 The Pine-Richland quarterback committed to the University of Pennsylvania in August, an unofficial end to his recruitment until he signed his letter of intent. Alex Hornibrook, a Malvern Prep quarterback, had decommitted and followed former Pitt head coach Paul Chryst to Wisconsin in January, leaving Chryst’s replacement, Pat Narduzzi, and new offensive coordinator and quarterbacks coach Jim Chaney searching for a signal-caller. Chris LaSala, Pitt’s director of football operations, already had someone in mind. “Coach LaSala had given him a list of quarterbacks, and I was the first one on the list and the first guy that he watched, and he said ‘Why isn’t this kid being recruited more?’” DiNucci said. Shortly after joining Pitt in January, Chaney contacted DiNucci’s head coach at Pine-Richland, Eric Kasperowicz. That’s when Pitt started recruiting DiNucci. A few days later Chaney watched DiNucci work out and throw, videotaping the practice and showing the film to Narduzzi later that day. The next day, the Panthers offered. A few days later, DiNucci took his official visit to Pitt. A couple days after that, he decided to spurn the Quakers and commit to Pitt. Through several months, DiNucci had fostered a strong relationship with Penn’s coaches. It was that strong relationship, along with academics, that originally drew him to Penn and made it that much harder to reverse his decision. “Having to pick up the phone and call their coaches and say I’m going to go elsewhere was definitely one of the hardest things I had to do,” DiNucci said. The appeal of playing major college football at his hometown school, though, was too great to pass up. “It’s 30 minutes from where I live, it’s ACC football, the academics are still very good and just the fact that I’d be able to play for my hometown and being able to say I’m playing at Heinz Field in front of 65,000 people is crazy,” DiNucci said. Still, DiNucci said he can’t help but wonder why Pitt didn’t call sooner. Beyond throwing at a Pitt camp last summer under Chryst, DiNucci said Pitt showed minimal interest, despite throwing for a WPIAL-record 4,269 yards in his senior season. Kasperowicz, a Pitt alumnus and former linebacker on the football team, said what scared some programs off were physical traits. “He’s one of those guys, based on his size, he’s not going to get the Power Five offers flying off the table. He’s only 6-[foot]-3, about 200 pounds. Some of these other guys are 6-[foot]-5, 220 already,” Kasperowicz said. The reality of recruiting the quarterback position, Kasperowicz said, is that if a player is not well above average physically, then he’s likely not getting offered by loads of major conference schools. How good is DiNucci? ESPN ranks him as the 27th-best pro-style quarterback in the 2015 class. Kasperowicz, though, had loftier praise for DiNucci. “Hands down, without a doubt, best quarterback in the state of Pennsylvania, probably top 10 in the country based on what he did this year. Also the leadership skills and [the fact that] he wins, which, ultimately, is the best measure for a quarterback,” Kasperowicz said. Besides his ability to win — DiNucci led Pine-Richland to the PIAA Class AAAA state championship game this past season­ — Chaney saw various aspects in DiNucci’s tape that he liked. “He likes that I have quick feet and can extend plays and make guys miss. He also said he likes that I have a fluid throwing motion and can throw from a bunch of different angles and put the ball where it needs to be,” DiNucci said. Of Chaney and Narduzzi, DiNucci had equal praise. “They’re probably two of the best recruiters I dealt with, just because of their character and the people they are and how much you can tell they love the game and love recruiting,” DiNucci said. In the months leading up to DiNucci’s arrival at Pitt­ — he will move into Pitt by June 21­ — the quarterback said his main focus is putting on weight and muscle. At 190 pounds currently, DiNucci hopes to arrive at Pitt between 205 and 210 pounds and take the field from there. “I would like to compete as early as possible, push Chad [Voytik] and push myself as hard as I can to battle him, and, if that doesn’t work out, a redshirt or whatever they end up doing,” DiNucci said. Regardless of whether or not DiNucci redshirts, Narduzzi has the utmost confidence in DiNucci.